“Mera bas ek lakshya tha. Pesa kamana hai,” says Narendra Raval, settling his one particular hair strand on his forehead, posing for a photograph. “Aa latt mara mate lucky che (this strand is lucky for me),” he clarifies. Narendra Raval (Guru) didn’t have to go to B-School to learn his lessons for becoming steel king in a foreign land. He found his knowledge outside the college, serving as a Pujari at a Swaminarayan temple in Maathak village of Gujarat. Starting his career in a temple, Narendra Raval worked his way up doggedly. From selling bangles and hair-bands at village fair to reading palms to starting his own steel trading shop in Kenya – could have been an achievement enough for most. Not Narendra Raval. He came to Nairobi like a million others, just to snap that one chance to go to foreign. Narendra Raval has risen from a humble priest at Swaminarayan temple to being the owner of Kenya’s largest steel and cement empire – Devki Industries. Narendra Raval was born in 1962 in Morbi town of Guajrat. They were 2 brothers and a sister – Narendrabhai being the eldest. “My grandfather was a teacher and my father had a small oil-engine spare part shop. It wasn’t particularly profitable, but it somehow eked out a living.” The senior Raval studied at a school in Maathak till class 5. “It became difficult to study at Maathak after class 5 so I moved to Surendranagar to study at Manav Mandir Vidyalaya. My class had 30 students, most of them studied for free. I managed till class 7 in that school before I moved to my maternal uncle’s place to study class 8. Soon, I moved to Bhuj. Since I was a Brahman, I took up as being assistant to priest at a Swaminarayan temple along with which I finished my class 12th. Studying Sanskrit was compulsory at our school, the language came handy to me in this job. I used to wake up at 3.45 am, take my bath and carry out the Mangala aarti and then Shringar. I had to then rush for my school so another priest carried the Rajbhog ritual. After I returned from school, I carried Sandhya and Shayan for the God. That was my routine”, he recalls. Serving to Swaminarayan sect doesn’t come easy. No booze, no smoke, no girls. How did he manage? I remember when I was in higher secondary, I had a friend who managed to get a packet of Benson and Hedges to smoke. It was a shiny, golden packet. I was very tempted to try it and I almost took the cigarette in my hand. However, someone from within stopped me and I gave it back. I’ve never smoked or tried anything that could become my addiction”, he says recalling his adolescent years. Narendrabhai took up Commerce as his subject because it wasn’t difficult, I had heard. At fairs in the village during festivals, Raval used to pair up with his brother and both sold bangles and hair bands to earn some extra money – Rs. 100 a day sometimes. He did his first business when he was 12. The eldest son of the family, Narendrabhai’s only intention was to earn enough money to be able to afford education of his siblings. “My brother wanted to do mechanical engineering from Dayanand Saraswati College in Bangalore and they demanded for a donation of ₹2 lakhs. I made up my mind that day to give up anything to earn enough money for my sibling’s education”, he shares. With his class 12th coming to a closure, Raval had no plans to study further. Pesa kamana tha. He had almost convinced one of the temple visitors whose palm Narendra used to read, to take him to Muscat as a cook. However, he was not even 18 and somehow couldn’t manage to get a passport. He didn’t stop trying. “Temple’s mahant called me one day and told me there was an urgent requirement of a priest at one of the temples in Nairobi. It was the first time I was hearing the country’s name. All I knew was that it was out of India.I didn’t ask him a single question and said yes. It was my chance to sit in a plane and travel outside Gujarat. My father wasn’t very convinced though, since I was very young and slavery, child trafficking were wide-spread practice in Nairobi. I assured him that I will manage. I had made up my mind,” he recalls. He remembers exactly – it was Saurashtra express that ran at 4:00 am from Bhuj to Mumbai. “My father and my maternal uncle came to drop me to airport in Mumbai. My father still didn’t seem pleased. When the plane hostess asked me to tie my seat belts, it was difficult to understand. I thought the plane whirls around and people could tumble,” he says laughing. Today, Narendra Raval is a certified pilot and flies his own helicopter. I told all the visitors who came to temple to send their children at 8:30 am for prasad. I loved cooking and my expertise was in making Mesu and Mohanthal. I lured the kids for it and they studied every Sunday for 3 hours, for the sweet. I read them our granth, Bhagwad Gita and other scriptures. I taught them values in a very friendly way, some of them quit smoking too, purely out of their own wish”, he says. To what started with 12 students became 250 students in 3 years. He was their friend, philosopher, ideal, teacher or whatever you could call it. He was their Guru. “I got this name from temple and people still call me Guru,” he says bringing out his not-so-fancy visiting card that reads ‘Narendra Raval (Guru), EBS’. I question what EBS means? “Elder of Burning Spear. It is like Padma Vibhushan in Kenya”, he says beaming with pride. Narendra Raval is 12th person in the world to receive this accolade. Meanwhile, Guru also read quiet a lot from Engineering books available to him. On his trip back to India after 3 years in temple, Narendra was convinced by his parents to marry. Serving to Swaminarayan sect, this looked difficult to him. He went up to Mahant and discussed this with him. Mahant explained to him that since he is eldest in the family and so the more responsible one, it was imperative for him to get married. “I was convinced of the fact that I will have to marry. I was 21 then. I had come with a return ticket to Nairobi. I had an option of staying back, which was more comfortable because at Nairobi, I couldn’t stay at Swaminarayan temple anymore as it wouldn’t set a good example for other followers”, he says. Though confused, he took the leap of faith and returned to Nairobi. The shocker came when he landed on the airport. Palm reading had always taken him places. It was some businessman whose future Narendrabhai predicted. “Mahendra Patel. He was a steel manufacturer.He asked me to accompany him to his company and work with his father. My job role was to take his father, Dayabhai Patel, from home to office and back. I didn’t even have a bag then, it was just one theli. I picked it up and made my way. I used to help him with his pooja. I stayed at their house for 1 year”, he shares. Soon, the Patels separated and company shut down. Being a companion to Dayabhai for one year, Narendra had learned some nuances about the business and steel. Risk taker as he always was, Raval took Rs. 4 lakhs from one of his Yajman to set up a steel trading shop. It was tiny shop where he bought steel and sold steel. It was around this time he met Neeta through relatives, a medico, who is now his wife. “We had very clear expectation setting before getting married. I told her it won’t be easy with me and that she would have to stay at Maathak for the initial days. She agreed. After marriage, we both started the business together”, says Narendra Raval. The couple worked 6 and a half days a week. Sunday evenings were spent at Maaru na bhajiya where they used to catch up over chips and bhajiya. Both worked in shifts. When he’d be resting, she’d be on work and vice-versa. Come 1987, Narendra Raval became Kenya’s largest steel trader. By 1988, Raval sensed he couldn’t get enough material to meet the market demand. Palm reading came to rescue, as always. Once the factory began, Raval made up his mind to buy a mill in Punjab. He came to Delhi from where he was supposed to take a Shan-e-punjab. Thanks to the flood, the train arrived late by 7 hours. In 1988, his turnover doubled over 30 times. As the business picked up, Raval sensed good opportunity in affordable roofing and fencing solutions. After discussing the plans with a bank, he set a small steel rolling mill in 1992 at Athi River. Giving competition to just a couple of steel rolling mills in Kenya that had monopolized the market for long wasn’t easy. “It was not easy. At the time it was difficult because as a startup, we had little cash flow. Also, the big steel companies were always frustrating us and trying to destroy our business. We came into the business with a plan to provide high quality products at affordable prices and make small margins. Whenever we sold a product for $10, they would sell for $9. Because they were bigger and always purchased large volumes, they could negotiate with suppliers to get their raw materials cheaper and still make a profit selling at a price lower than ours. I couldn’t compete with them. Within 6 months, I was almost on my knees. No one was buying our products because they could get it at a cheaper price from our competitors. We had tons and tons of raw materials and finished products just taking up space in our warehouse. It was a nightmare”, he quotes in his Forbes cover story. He informed his staff that he’d not be able to pay them more than 20% of their current salary. “I had a stock of over 6 months because we were just not able to sell at competitive prices. Suddenly international prices for steel rose to 3 times in 4 months. Because I had my stock, I sold it and soon, I had enough money to pay the salary to my staff and also to clear company’s loan”, he says adding that his staff has always been very supportive of company’s progress and proudly mentions how some of those 70 people are still working with Devki group along with 4000 others. Narendra Raval also ensures education and employment of his employees’ children. Guru was reportedly approached by Africa’s richest man, Aliko Dangote to completely buy one of his companies – NCC (National Cement Company) but he refused. READ Meet Vishwaraj who is all set to bring pride to India at Asian Winter Games 2017! NCC produces 2 million metric tons of cement annually. Talking of his future expansions, Narendra Raval says, “We are expanding into neighboring countries – putting up a $200 million cement manufacturing plant in Kajiado. Planning for Zambia, Congo and Uganda is up. With India, we are keen on cement and packaging plant, however, we are checking it’s feasibility.” Mr. Raval prefers spending his free time alone to think or flying with his family. He cooks on weekends and also has a hidden talent of playing manjira. He is a living success story which didn’t really follow any ‘success formula’. I sometimes feel really disappointed to see today’s youngsters taking the shortcut and if nothing works, suicide as if that is even an option! Be it business or life, what you get easily, goes away easily. Perseverance and focus is the key. If you fix a goal, run behind it 24×7. Hath dhoke pichhe pad jao. Warren Buffet and Mother Teresa (Ironic, yes!) inspire Mr. Raval, who is himself a commendable combination of capitalist and socialist ideologies, both in the right amount. “I owe to Kenya and it is my goal to ensure every Kenyan has a roof on their head”, says the steel king who has worked with groups hosting 63 orphans, 19 of whom are HIV positive at his Devki orphanage in Athi River. He also provides medical support to widows and offers them funds to open small businesses. Narendra Raval has deep respect for his roots in India. When earthquake struck Gujarat in 2001, Mr. Raval wasn’t yet very wealthy. 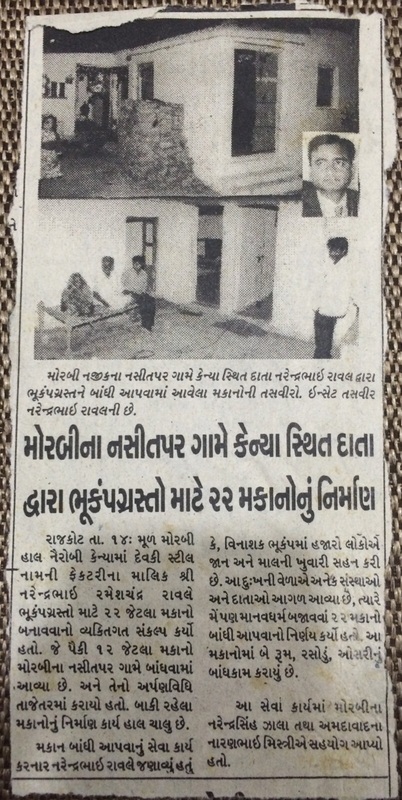 Narendra Raval helped build 22 houses in Morbi which was devastated during Earthquake. Narendra Raval made his place on the front page of Forbes Africa Magazine’s May 2015 edition. Mr. Narendra Raval receiving UK’s Philanthropy award. In the picture (left to right): Mrs. Clegg, Dep. 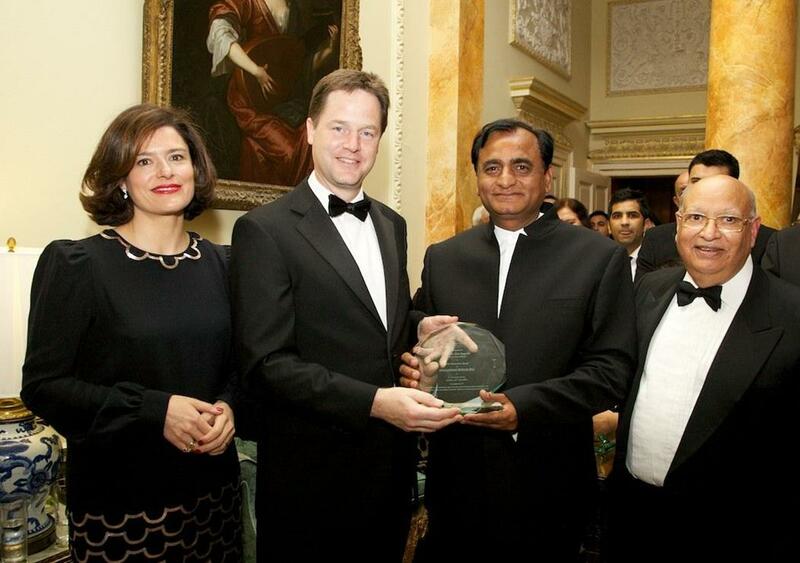 Prime Minister Nick Clegg, Mr. Narendra Raval and Lord Lumba. Is there a quote you live by, sir? I ask. A confused shopaholic from Indore to building a her own startup in Delhi, Meghna’s story is inspiring!